my breaking heart made this silent request, “Please… My Dear Lord God… please, …bury me with my child! I began to think of the happiness my daughter would never know… falling in love, and all the whimsical delights that come with a true first love… her wedding day, and the excitement of watching her bounce down the aisle. 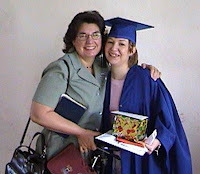 I remember how Kimberly, with her arms flared at her sides, had bounced down the aisle of her ‘05 highschool graduation. When she later saw herself on video, she laughed and wondered if she would bounce at her wedding…but now, we will never know. We would then, eventually, have looked forward to her pregnancies and her babies… all Kimberly ever really wanted, from this earthly life, was to be a wife and a mother. My h eart ached for the happiness she would never know. “Why not,” was His gentle reply. “Why can she not be with Me? Though I know you love her, I have always loved her more. She is safe with Me. Nothing more will hurt her. All her anxieties are passed. She will never know another disappointment. All her struggles have ended. Her fears are all gone. Oh, how His heart must ache as He sees us struggling through this earthly life. My disappointment with the Lord ended as I conceded to the realization that this earthly life has limited moments of happiness sandwiched between endless disappointments, struggles and heartaches. I cry every day, not because of what she missed but because my sorrow is in the missing of her. The rest of my earthly life is still a very long time to wait until I will hold her again. I will always hurt… but I am not bitter. There will always be a sadness… but I am not angry. My tears will always come easily… but don’t expect me to restrain them… tears are often the consequence of loving memories. My sorrow is deep and I am forever changed…this is the reality of grief. Descriptive Bible verses express my sorrow, and I know I have a Saviour who is touched by my grief. My comfort is through the Lord Jesus Christ, and my counsel is from the Word of God. I am in awe… that He would know… with an awareness so profoundly expressed through these verses, just how deeply I grieve. There is a great misconception about God in relation to how He cares for his children. Many think that being a child of God means He is to keep us from the troubles and distresses of this earthly life. But, this is not so…God is not in the ‘keeping us from’ …He is in the ‘carrying us through’ of life’s heartaches. “God will not put more on us than we are able to bear.” is not a biblical teaching.It is a mis-teaching, taken out of context, from I Corinthians 10:13. My Lord knows… my Lord understands… He cares, and He is touched by our sorrows. If I had not already known Him as Saviour, and the assurance of Heaven, then I would not now know the grace of His comfort and the mercy of His peace. It is through this tragedy, of our daughter’s death, that my loving Lord has been so dearly close. I do not ask the Lord to mend my broken heart because I am asking that He preserve my memories and to grant me access to things I had forgotten… my tears are the evidence of this answered prayer. If I do not daily choose these… then, by my neglect, the darkness will come and the sorrow will overwhelm me until my heart is devoured by grief and there is nothing left but the hollowness of bitterness and disdain where once there was a heart. God is not in the business of making super Christians, but He is in the business of taking surrendered Christians and doing something amazing through their surrendered lives.